Book Review: Why Don’t They Just Get a Job? – Happily After Retirement! Book Review: Why Don’t They Just Get a Job? We’ve all said it or at least thought it, haven’t we? Why are there so many people taking public assistance, money, food and other handouts from the government? Why don’t they just get a job? Well, this book reveals some of the issues and barriers that people living in poverty must deal with in order to become self-sufficient. Although this book, Why Don’t They Just Get a Job? One Couple’s Mission to End Poverty in Their Community by Liane Phillips and Echo Montgomery Garrett is based in Cincinnati, just imagine it takes place anywhere in the U.S. This book details a story about a retired married couple who wanted to make a difference in their community. They had a dream to help unemployed poor people get a job and become self-sufficient and take control of their own lives. The objective was to train new workers to meet employers’ demand for productive and reliable entry-level employees in the Cincinnati region. They created a not-for-profit organization called Cincinnati Works as a way to partner with all willing and capable people living in poverty. Their plan included helping them acquire and retain self-supporting jobs. They started slowly and learned to adjust their expectations, to redesign courses, to move to a new facility where bus transportation was easier to access, to hire people who had an understanding of the population and to continually measure, evaluate and measure again. The data came alive in their stories through their successes, failures, struggles and dreams. 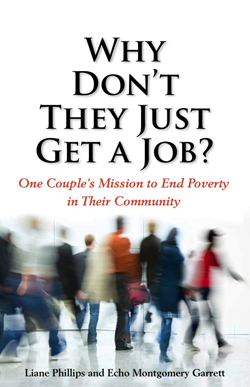 As you read the pages, you understand some of the hurdles that people in poverty face during the job hunt. Finding day care is one of the biggest issues, hassles and expenses involved in getting a job. Day care centers may only take children in one age bracket so if there are more children in the family, this means several daycare centers must be found, they must have openings, must be within reasonable range and must be affordable. Transportation issues, cost issues, safety issues and job related schedules are just some of the constraints these people face. Once a person does secure employment, their pittance of an income tends to reduce government assistance such as childcare assistance, food stamps or a housing stipend. Moving forward often means moving backward in many different ways. Cincinnati Works is a blueprint for cities to follow to put thousands of people to work without using any government funding. The organization believed in a cost-effective solution to eliminate poverty by using existing resources. The lessons they learned, the data that was collected and the successes of the clients are there for other communities to emulate. This not-for-profit organization offers a range of employment services to the entry-level job seeker with a focus on job retention and promotion. It’s a beautiful relationship and a testimony of what can be done in communities across the country. Why Don’t They Just Get a Job? Previous Post A Day 2011: A Reason to Celebrate! Next Why Don’t They Just Get a Job, You Wonder?